Manchester brewery Seven Brothers has completed a £500,000 crowdfunding drive after attracting investment from more than 850 craft beer fans. 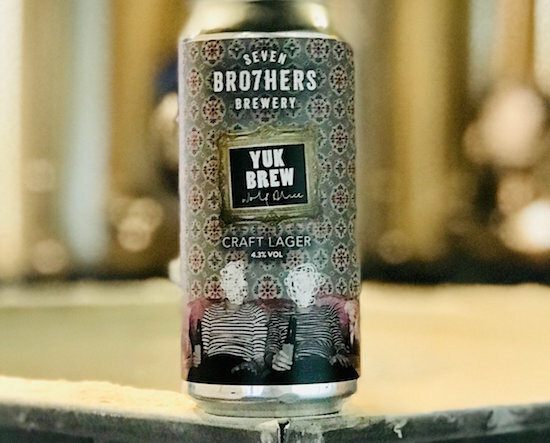 The family firm has just received a major publicity boost after teaming up with Mercury Prize-winning band Wolf Alice to launch a collaboration beer called Yuk Brew. That followed hot on the heels of a beer made in partnership with Kellogs, using Cornflakes that were either too big or too small to go into cereal to create Throw Away IPA. All this news has helped Seven Brothers gain plenty of attention and it has smashed its crowdfunding target. That will allow it to open another beerhouse and hire more staff to spark an expansion drive across the UK. Seven Brothers is now forecasting sales of £2.5 million in 2019, rising to £4.4 million in 2020 and more than £7 million in 2021. The McAvoy brothers – Keith, Kit, Nathan, Greg, Danny, Luke and Guy – set up the firm in 2014 and the beers have gone national after picking up a listing with The Co-op. The seven brothers have four sisters too, and they have set up a distilling business called Four Sisters. They have brought in Keith Webb, former managing director at Bargain Booze, to help grow the business, and he sees great potential for it. The Wolf Alice collaboration is a major coup for the brothers, as the band is currently flavour of the month following its Mercury Prize victory, which saw it beat Noel Gallagher, Lily Allen and Arctic Monkeys among others. Yuk Brew takes its name from the name from Yuk Foo, a popular track on the band’s prize-winning album, Visions of a Life. Wolf Alice often gigs in Manchester and the team at Seven Brothers invited them to visit the brewery. Drummer Joel dropped by in June 2018 after supporting the Foo Fighters and he was so impressed that he suggested a Wolf Alice brew. “The band put us in touch with their management and, around their packed tour itinerary, we managed to get a meeting arranged in September in their management’s offices in London,” said Keith McAvoy. “A few samples later, and interrogating what they liked, which turned out to be lager, and their preferred brands, Keith Webb and I headed back up north to discuss with brewers Greg and Jack. “After a bit off trialling we came up with a Vienna-style lager and the band visited the brewery in October for a tasting session. That went well, so we were off, on a race to get everything done for the band’s three big gigs in December. The band members selected the name and delivered the iconic branding alongside it. Initially Yuk Brew is produced in kegs and 44cl cans. “We believe it is perfectly suited to student areas and music clubs and venues and we will be adding it to our portfolio from January,” said Keith McAvoy. Webb added: “The craft beer market continues its upwards trajectory, but it still represents a relatively small part of the beermarket at 5-6%. “Maintaining that growth will be dependent on the producers producing consistently excellent brews that satisfy the craft beer curious as well the aficionados. “The Seven Brothers Brewery has staying power in a packed market, with a best-selling core range of seven beers and a rolling programme of collaborations with brewers such as Electric Bear and Brewdog in Manchester. “The beer and music industries are, of course, symbiotic. Over the years there have been a number of beer and band link ups but the Seven Brothers link up with Brit and Grammy nominated Wolf Alice delivers a new level of opportunity. “Wolf Alice are the 2018 Mercury Prize winning London band, who also won this year’s Q Magazine Best Live Act accolade. One of the tracks from the Mercury winning album Visions of a Life is Yuk Foo and the band selected Yuk Brew as their lager’s name. Instantly recognisable to the band’s fans the name will grab the attention of everyone who sees it. The brew made its debut at the band’s three huge end of year gigs, one in Manchester and two at the O2 Brixton Academy. “Wolf Alice spent the few days before the gig and launch ramping up the excitement around their lager. There were the 672 cans at the Manchester gig and they sold out in less than an hour.